Made from soft, natural merino wool, strong, lightweight Durawool, and Robor hollow fibres, these ladies X-Socks Lightweight Merino Trekking Socks have been anatomically tailored to the unique shape and requirements of women's feet. Narrow Arrow Construction ensures that these X-Socks are perfectly shaped for a woman's foot, improving the fit and protective cushioning, preventing wrinkling and defending pressure points during movement. 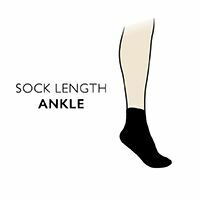 X-Socks use left/right bias, anatomically positioned, varying thickness cushioning across different foot and leg zones to protect against injury, and to ensure that your foot always has the best contact to your chosen hiking or trekking footwear. Activ-Bund perfect hold cuffs and flat toe seams protect against discomfort from pressure and blistering. X-Socks technology comes into play again with patented, temperature-regulating AirConditioning channels for dry, fresh and bacteria-protected feet.